I am the Finch Wench | The world is an aviary. She was the closest to a daughter that I shall have in this lifetime, and indeed I proudly state that she was undeniably a daughter of mine. She liked to stay up at night and sleep late. She was into everything. She dabbled in mischief but always stayed safe. She was a trooper who commanded the royal treatment of a princess. I learned so much about Bulbuls and enjoyed an intimate and privileged peek at avian life with her. I also learned to be my own person from that little feathered person. Her lifespan shall exceed her wingspan for all who knew her; she’ll forever have nest in my heart. I spent the Thanksgiving holiday with relatives in Saint Louis, Missouri. We went to the local zoopark, and I enjoyed the opportunity for some backyard and urban bird-watching. As nice as it was to see the Cardinals of Saint Louis (of course, I mean the birds not the baseball team), the ornithological highlight of the trip had to be the sighting of the Eurasian Tree Sparrow (Passer montanus). We started out by driving around in the Dogtown community which includes the Clayton-Tamm neighborhood. After we spotted suspected Eurasian Tree Sparrows (not to be confused with American Tree Sparrows, who are not true sparrows but buntings) perched on a wire, we decided to park somewhere and walk around. Near our parking spot, songbirds could be heard, and a possible predator was lurking on a lamppost. We headed back on foot toward the site of the drive-by sighting of suspicious silhouettes on a wire, and I had already trained my eye to scan for all of the feeding stations dutifully maintained by the residents of the neighborhood, even after a rainstorm. While walking eastward on Lloyd Avenue, just past Graham Street, I spotted a little black cheek spot like the pupil of an eye gazing out at us from the center of a shrub. 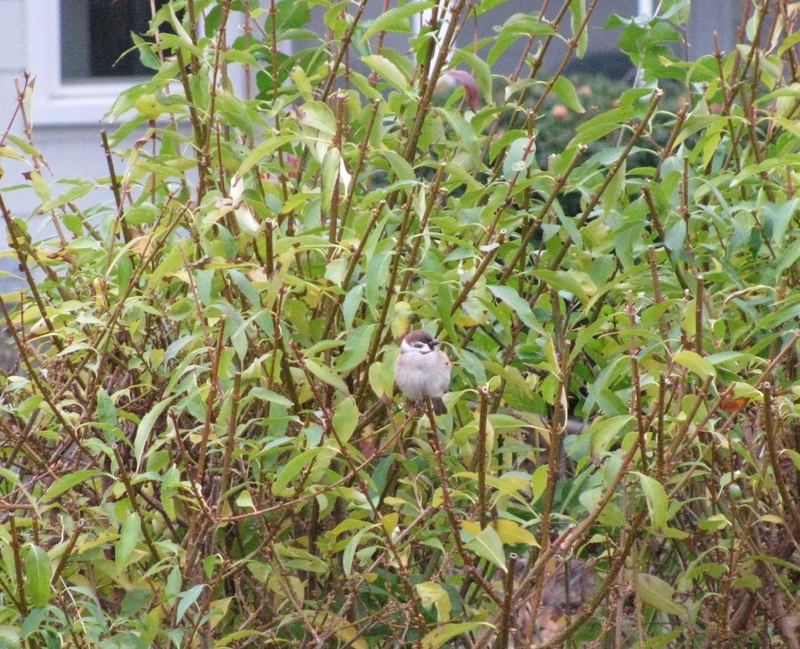 This was our first confirmed sighting of the Eurasian Tree Sparrow in Saint Louis! This is nearly the very instant of our first confirmed sighting of the Eurasian Tree Sparrow in the States on 27 November 2011 at 12:53 CST. Indeed, they were exactly where they were supposed to be! Last May, I spent a day in Fallbrook at Emerald Forest Bird Gardens, the very source of our Toucan beak and feather specimens (NB: No birds are harmed in this research!). The special occasion was a NOVA filming event for the “Making Stuff” series, the first part of which aired last week. I was very pleased to see that our Toucans had their moment in spotlight! 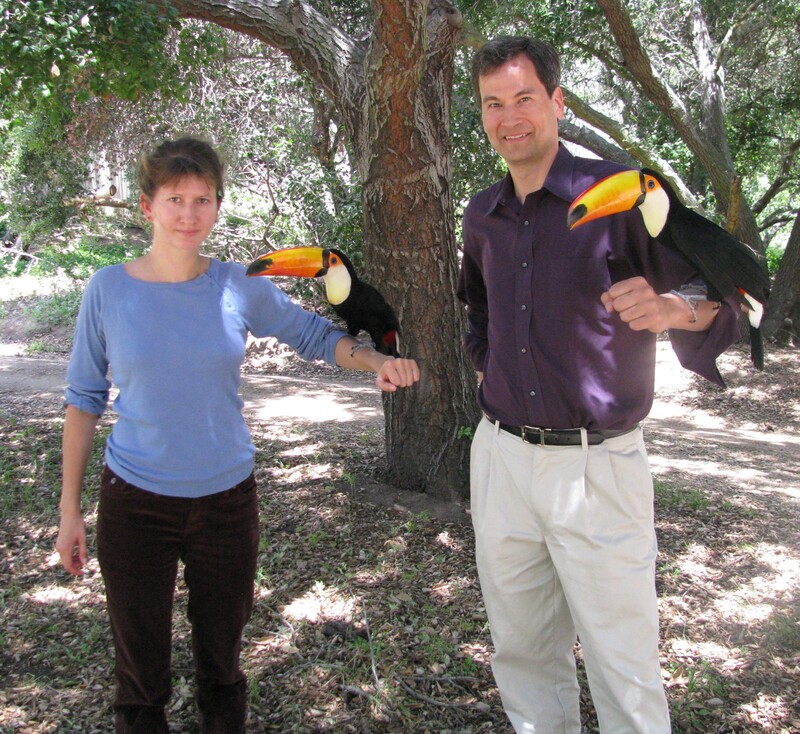 Me, Tocos, and David Pogue on 13 May 2010 at Emerald Forest Bird Gardens. I took many, many more photos. Also, I had the privileged opportunity to see my ex-advisor being coached by the director: “Marc, don’t look at the camera. Marc, you’re looking at the camera. Marc! Marc, stop.” It was awesome (in a vindictive sort of way). The polished final product is available here. The Toco Toucans are featured in Chapter 6 with some cameo appearances in the introduction.